A good balance of price and sound quality that uses a format rarely seen at this end of the market. Low frequency extension. Realistic mid range. Plenty of power. Highs a little low for our taste. Three-way powered monitoring could crudely be considered 50% more difficult and expensive to deliver than a two-way monitoring system. As a consequence, three-way designs are rare in the lower budget monitor market. This seems to be a red rag to M-Audio, which has released the M3-8 and (smaller) M3-6 models. This review only concerns the former. The M3-8s are large, though not particularly heavy. The subtly shaped wood veneer front baffles give them a hi-fi look, as opposed to the clinical aspect of many studio monitors. "The low-end is relatively even and can deliver a healthy punch without sounding artificially beefed up"
Though they look like two-ways, the upper driver is in fact a coaxial or inline MF/HF driver with a 1-inch silk dome tweeter and waveguide at the centre of a 5-inch woven kevlar mid-woofer. The LF driver cone is also woven kevlar. The three power amplifiers deliver a total of 200 watts, which produces plenty of 'gust' when cranked right up. The rear of the cabinet houses a bass reflex port, a heatsink for the amplifiers and the EQ contour controls. The volume control (-30dB to +6dB from line level) is followed by the three EQ cut/boost knobs which allow ±6dB adjustment at 100Hz, 1kHz and 10kHz centres for the three driver amplifiers. There is an EQ bypass switch which makes adjustment checking easier, as well as taking equalisation out of the signal path entirely. The knobs are stepped so matching is not a long guessing game. A low cut switch brings in a cut at 80Hz or 100Hz for use with a sub-woofer (we assume). Inputs are via XLR, 1/4-inch TRS or RCA. Once the little blue light between the drivers came on to let us know the M3-8s were ready, we set about throwing all manner of material at them to get my ears acquainted. 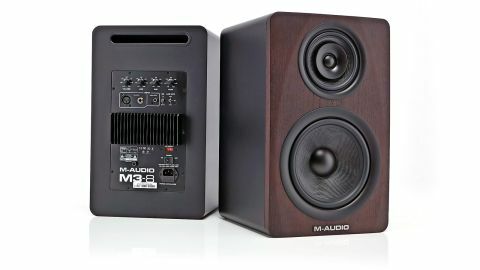 First up there is a weighty low-end capability that keeps a sub off the shopping list for all but the most bass thirsty. The low-end is relatively even and can deliver a healthy punch without sounding artificially beefed up, but it is by no means as tight and accurate as you'd expect from more expensive models. At the other end of the spectrum the 1-inch tweeter puts out a smooth high-end that we immediately cranked up with the EQ control as it sat too far back for our taste. "The stereo imaging is good and the off axis response better than many two-way models in this price range"
Care has to be exercised as the 10kHz centre of the EQ boost starts to pull out a harsh band, as you'd expect, and we'd have preferred a boost much higher up as it was the >15kHz range we wanted to pull forward. The flip side of this softness is a lack of fatiguing, even at high volumes. The mid and low mid response of the M3-8 is more forward than we are used to but, with a little trim at the back, things settled down for a more confident mix placement of vocals, guitars and snares. The low mid range did feel a little 'bunched up' and a tad tricky to disentangle sources - whether this is a product of the 450Hz crossover, the cabinet resonance or the driver damping, we're not sure. It is in this awkward and critical range that the budget aspect of the monitors comes to bear. The stereo imaging is good and the off axis response better than many two-way models in this price range. The overall integrity of the sound does not fall apart at high SPLs, though the LF driver starts to feel like it's playing catch up on heavy bass hits at the upper end of the volume knob, which is fair enough as we wouldn't want to mix at that level for long. For the price the M3-8s do perform well and have a mid clarity advantage over many two-way models. Their not inconsiderable size doesn't make them an easy fit for small spaces, but it does allow for that extra low-end extension. The EQ controls will help tailor to the room, but the frequency centres are a little misplaced to get these monitors singing their best. Plenty of boom for the buck though.